"After a series of minor disappointments today that made me unreasonably bummed, I was reminded of how lovely the universe can be again by the kiddos' piano teacher at Friendly School of Folk Music.She continues to build her repertoire of Taylor Swift for Ella, and for Archer she has color-coded the keys and the music after consulting with an ABA therapist, and because he would really rather be playing drums she learned 7 nation army and taught it to him on the drums while she played along on guitar so he could feel like he was playing in a band. Each week she outdoes herself. The first week he had a full meltdown and we basically all left crying. Today is nine weeks later and I couldn't drag him out--he popped back to the practice room, made eye contact and just said "hi" and stood there, all cool, like they were going to hang out afterwards. Being a parent of a child with autism you basically get to see the best and the worst in people--today I definitely got to see some of the best." "My son has been going to Friendly School of Music for two years and I highly recommend their newest teacher, Hannah Rand. Hannah has a wonderful way of relating things in musical terms that my 3-year-old would know about in life. My son is excited to go to his lesson each week, and comes out telling me about the fun he is having. These are private, half-hour lessons at a price that is extremely affordable. 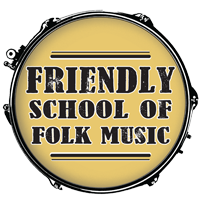 Friendly School of Music is non-profit, 501c3, as well, which is great because their attitude is all about helping the community." "She treats my children as she does her own and that is heartwarming to see. I truly think Ms. Leah’s classes have contributed to my kids’ growing vocabulary and helped them communicate verbally through music. Ms. Leah is definitely one of those teachers my kids will remember and talk about forever. At such a young age, she has already made a big impact on their lives."